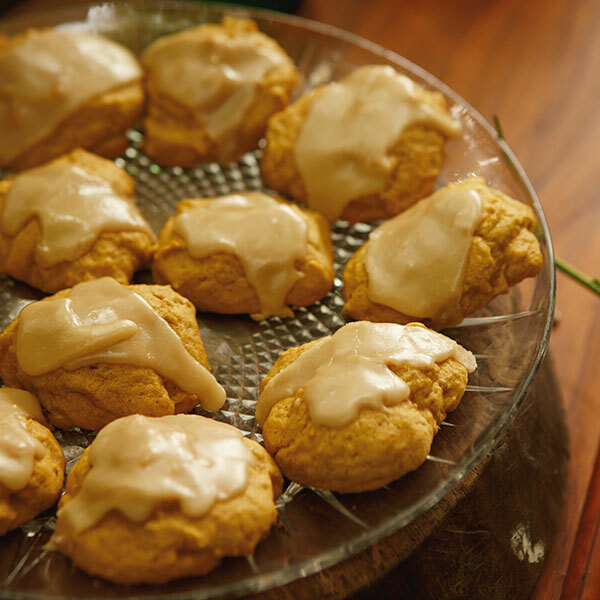 These soft, fluffy cookies topped with a brown sugar glaze put the mmm in pummmpkin. Canned pumpkin, flour, sugar, eggs, brown sugar and other spices create a velvety dough easily dropped by the tablespoon on ungreased baking sheets. After they cool, spread the creamy glaze on each cookie. This easy Pumpkin Cookie recipe is great for classroom parties or other Halloween or fall get-togethers. Preheat oven to 350°F. Cream butter and sugars together in large bowl until light and fluffy. Combine flour mixture with butter-sugar mixture. Drop tablespoonfuls 3 inches apart on ungreased baking sheets. Bake for 10 to 12 minutes. Remove from oven when cookies are golden brown around edges. While cookies cool, make the glaze. Heat butter and brown sugar over medium heat in saucepan until bubbly. Cook, stirring constantly, for 1 minute or until slightly thickened. Beat in the milk. Blend in confectioners' sugar until the glaze is smooth and spreadable. Use a basting brush or butter knife to spread glaze on cooled cookies. Tip: The glaze will harden fairly quickly. Keep it on the stove on lowest heat possible to prevent it from hardening.